LONDON — Liverpool's season continues to implode after second-tier side Wolverhampton Wanderers inflicted the latest setback in the FA Cup on Saturday. Wolves won 2-1 at Anfield to cap a week of misery for Juergen Klopp. The English Premier League title challenge faltered further by losing to Swansea, and the League Cup run ended in a semifinal defeat to Southampton. Another Premier League challenger came close to a greater humiliation in the FA Cup but Tottenham managed to fight back against fourth-tier side Wycombe Wanderers. 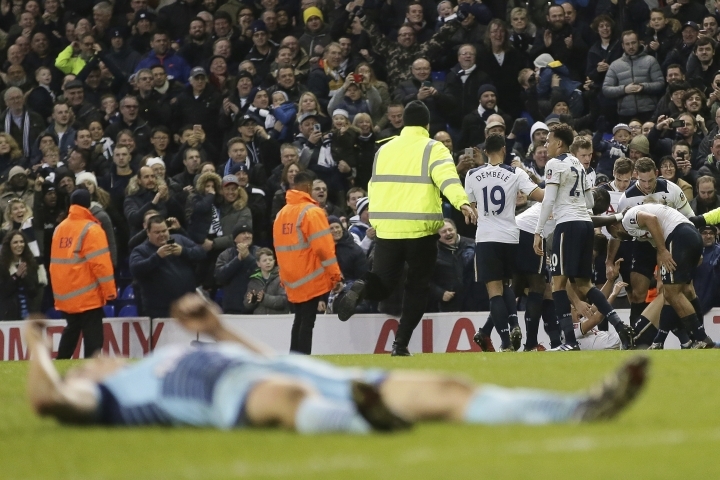 Son Heung-min pounced in the seventh minute of stoppage time to recover Tottenham's 4-3 victory. 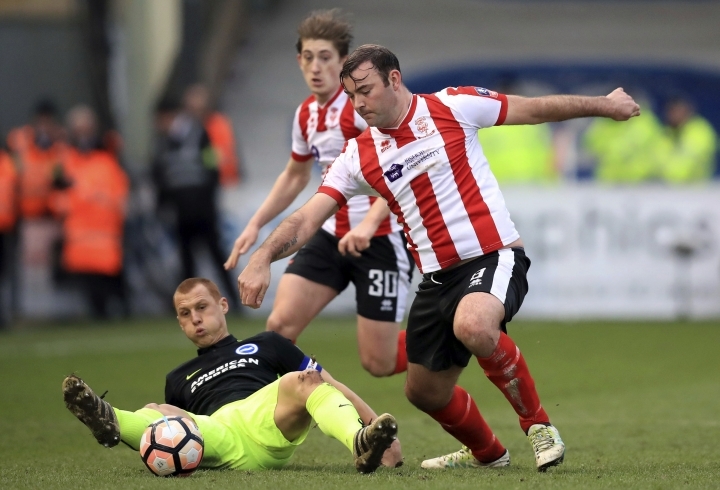 For the first time in 130 years, Lincoln will be in the fifth round after the non-league side upset second-tier League Championship leader Brighton 3-1. Premier League leader Chelsea had no trouble advancing, routing second-tier west London neighbor Brentford 4-0. An all Premier League-meeting saw Manchester City beat Crystal Palace 3-0. 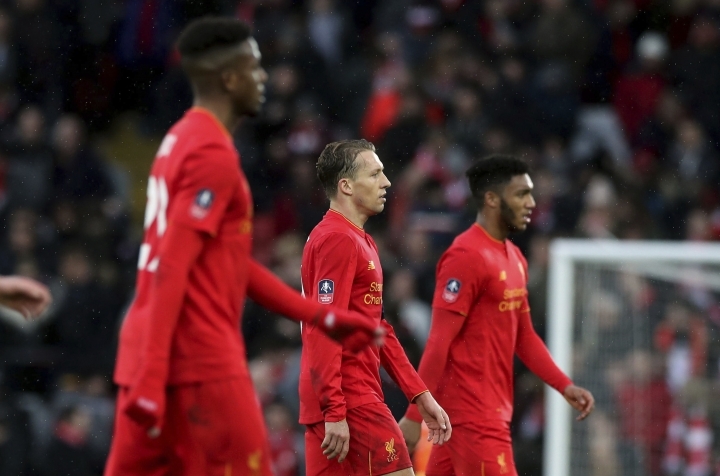 Since beating Manchester City on New Year's Eve, Liverpool has won only once in 2017, against fourth-tier side Plymouth in the third round of the FA Cup. Losing to Wolves at the next hurdle leaves Klopp with only the Premier League to contend for and Liverpool is 10 points behind Chelsea heading into Tuesday's game against the leader. 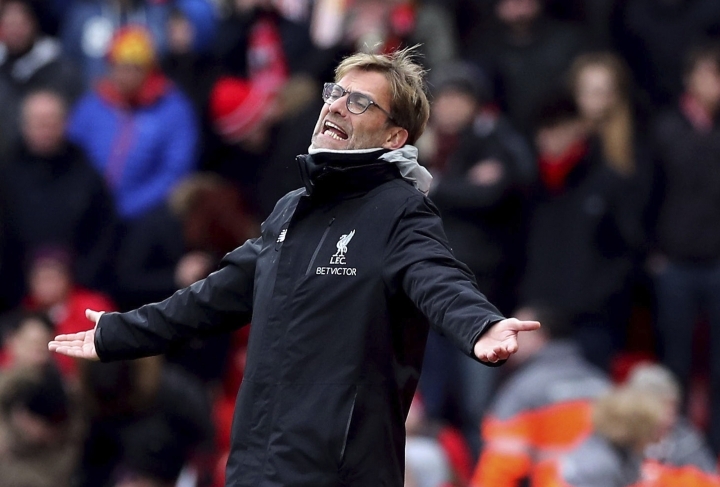 Klopp was angered by his team's collapse against Wolves but accepted responsibility for the "very bad performance." "If someone asks if this is the lowest point of my Liverpool time until now, I don't know," he said. "But if it is, it is a perfect moment to turn because it is not possible to go lower. "I don't think it is the right time to talk about being positive or optimistic. In this moment we feel really bad." The status of the FA Cup has diminished as even League Championship teams like Wolves use the competition to rest players. So while Liverpool retained only two players from the semifinal loss to Southampton, Wolves also made seven changes from its last league fixture. Richard Stearman headed Wolves in front in the first minute at Anfield and Andreas Weimann doubled the visitors' lead four minutes before halftime. Divock Origi pulled one back in the 86th but Liverpool couldn't force a replay against a team which is 18th in the 24-team League Championship. "I'm responsible for it," Klopp said. Wolves were once a leading team in English soccer, winning three top-flight titles in the 1950s before collecting the FA Cup for a fourth and final time in 1960. The central England team, which was bought last year by Chinese conglomerate Fosun International, has been out of the Premier League since 2012. Liverpool was Wolves' second Premier League victim this season, having knocked out Stoke in the third round. The League Two visitors to White Hart Lane led at halftime through captain Paul Hayes' double, including a penalty. Even after Son and substitute Vincent Janssen's penalty dragged a much-changed Tottenham level. There was a fresh blow for Tottenham, which played the final 20 minutes with 10 men after Kieran Trippier was forced off injured. All three substitutions had already been made. Garry Thompson restored Wycombe's lead in the 83rd but substitute Dele Alli gave Tottenham a lifeline. Son pounced to avoid humiliation against a team 70 league places below Tottenham in the league structure. The one positive — if there is one for Palace — is that Sam Allardyce no longer has the distraction of the cup as the London club looks to avoid relegation. 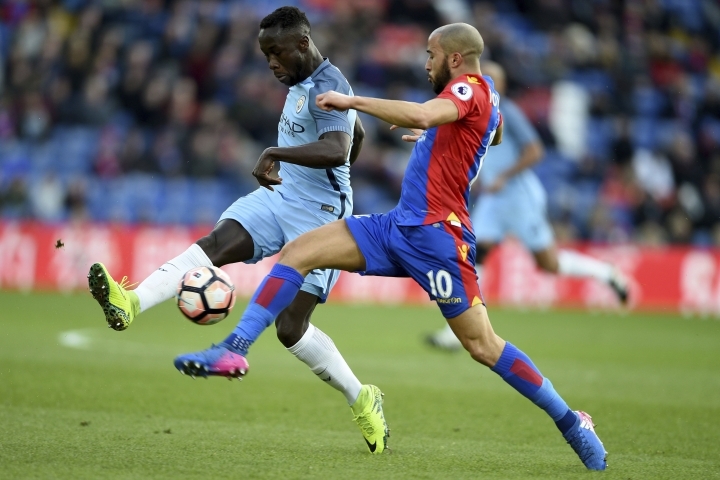 But the manner of this capitulation — with Raheem Sterling, Leroy Sane and Yaya Toure scoring — suggests it will be hard for Palace to escape the relegation zone. Branislav Ivanovic marked what could be his last appearance for Chelsea with a goal. With the January transfer window closing on Tuesday, the defender has been linked with a move from Stamford Bridge after nine years. 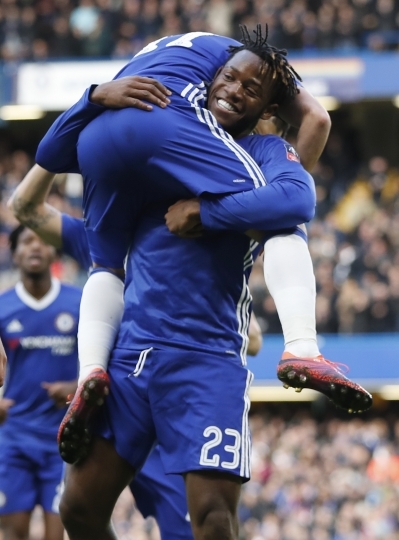 Willian, Pedro Rodriguez and Michy Batshuayi also scored for Antonio Conte's side. Theo Walcott scored a hat trick against his former side and Danny Welbeck, who has been dogged by knee injuries, ended an eight-month goal drought with a double strike against the League Cup finalist. Steven Defour delicately chipped the ball over goalkeeper Fabian Giefer in the second half after Sam Vokes' strike as the Premier League team reached the fifth round for the first time in six years. Rafa Benitez's cup hopes are over after Newcastle was humbled by third-tier Oxford. Newcastle's priority was always securing instant promotion back to the Premier League, with Benitez making nine changes at Oxford. Three Premier League teams face opponents from the League Championship. Manchester United continues its cup defense against Wigan, Watford is at Millwall, and Hull faces Fulham. Sutton will be looking to join fellow fifth-tier side Lincoln in the fifth round by beating Leeds of the Championship.